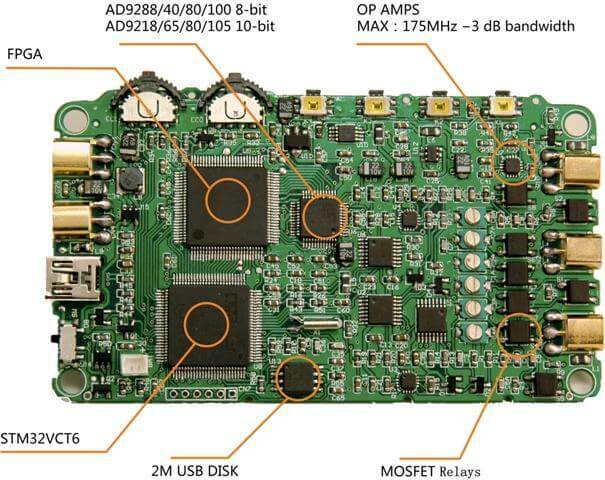 DSO QUAD in Development a More Powerful, Wearable Oscilloscope! You are here: Home Blog DSO QUAD in Development a More Powerful, Wearable Oscilloscope! News! This device is now at the pre-order stage and www.justblair.co.uk has an early review of the product here. Seeed Studio is developing innovative new products at an amazing rate. On their blog today they have announced a new oscilloscope which is currently in development and it looks like an exciting product indeed. I am already a fan of the DSO Nano, their first handheld oscilloscope, but I have to say what they have coming is even better! The renders they are showing are for a wearable scope. A first prototype has already been made, Named the Quad, this is a more advanced scope with more powerful performance and function. They hope to implement the following in the product. 2 Analog channel, 20mV to 10V/div, h36Msps sampling rate, approximate 30Mhz bandwidth, AC/DC coupling. 2 Digital channel, ext. trigger source. Simple AD measurement of 0-5V, DC coupling. 1 Analog signal generator output 10hz~20kHz customizable waveform via DAC. 1 Digital signal generator output 10hz~8MHz square wave. Interface for Bee series/FILM and Electronic Brick Sensors. Seeed Studio reckon they are still 2-3 months away from mass production of this design. At this stage they are still inviting comments and suggestions from their customers via their WISH platform. DSO Nano Pre-Order Available from Seeed Studio, Guess Who Just Bought One?